Fabian is 45 and lives in Sydney, Australia. His lower back pain began in mid-2015 and quickly progressed. Later that year, his local neurosurgeons told him he wasn’t a candidate for surgery, and to continue with physiotherapy. Over the next two years Fabian showed some good results with physiotherapy, however was making sacrifices with his work and quality of life. In this time he had 3 setbacks. He reached the point where conservative treatment was no longer effective. One of the remarkable distinctions in Fabian’s case is he developed a “lateral shift” in his back. He clearly leant to the left or the right when standing and walking. At times it was near impossible for him to stand straight without bracing himself. He contacted SkyGen directly and we helped him with an assessment of his case by Dr. Thomas Bierstedt and Dr. Bernd Illerhaus of the ONZ Centre in Dusseldorf. He knew their reputation for motion-preserving spine surgery and wanted to see if he was a candidate. 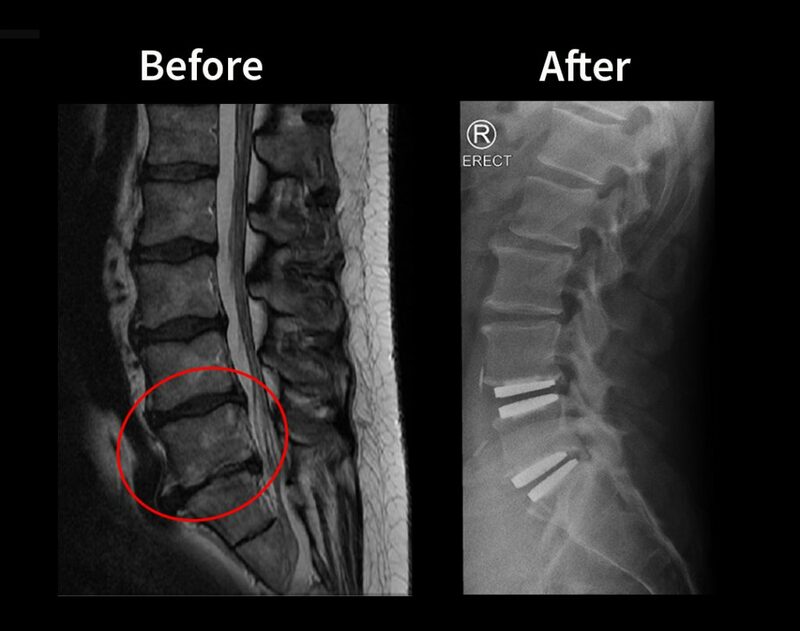 He was diagnosed with Degenerative Disc Disease in L4/5 and L5/S1. We assisted Fabian with his pre-travel tests organised through his trusted GP, and he soon received the “Green Light” from the surgeons in Germany and he was given clearance to proceed with the trip. There is another thing we didn’t mention. You may choose to add it to your web site if you like but don’t have to. We are very grateful to Dr. Bierstedt that he persevered with Fabian’s surgery. He exchanged that normally it takes 1-2 hours for double ADR. But Fabian’s took 3.5 hours. Why? Due to Fabian’s unusual blood vessels location. At 1 of the levels (not sure which one, either L4/L5 or L5/S1) it was difficult to push vessels aside… that caused excessive bleeding. His blood was collected, cleaned and put back in his body using their Cell Saver device – how amazing is that! ☆☆☆☆☆ That is why we are so grateful that his surgeon (and his colleagues in the theatre) didn’t give up on him, but he continued even through this complication and saved him.